Nevus araneus, also known as spider angioma or spider nevus, is a common benign vascular lesion present in 10-15% of healthy adults and young children. [1, 2] They may appear as a solitary or multiple lesions. In particular, when multiple lesions are present, liver disease, estrogen therapy, and thyrotoxicosis should be considered. The name stems from its physical appearance, which is characterized by a central red arteriole, or punctum, representing the body of the spider, surrounded by a radial pattern of thin-walled capillaries, resembling legs (see the image below). A spider nevus consists of a central arteriole with radiating thin-walled vessels. Compression of the central vessel produces blanching and temporarily obliterates the lesion. When released, the threadlike vessels quickly refill with blood from the central arteriole. The ascending central arteriole resembles a spider's body, and the radiating fine vessels resemble multiple spider legs. 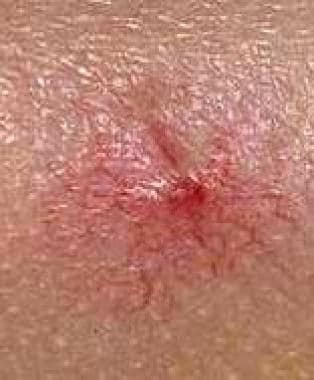 The frequency of spider angiomas (nevus araneus) is presumed to be similar to that in the United States. No racial predilection is reported for spider angioma (nevus araneus), but lesions are more apparent in light-skinned patients. Spider angiomas (nevus araneus) are asymptomatic benign lesions. When extensive, they may be associated with significant underlying internal pathology, such as liver disease. [6, 7, 8] Spider angiomas (nevus araneus) also may produce significant cosmetic concerns in some patients. Khasnis A, Gokula RM. Spider nevus. J Postgrad Med. 2002 Oct-Dec. 48(4):307-9. [Medline]. [Full Text]. Finn SM, Rowland M, Lawlor F, Kinsella W, Chan L, Byrne O, et al. The significance of cutaneous spider naevi in children. Arch Dis Child. 2006 Jul. 91(7):604-5. [Medline]. [Full Text]. Requena L, Sangueza OP. Cutaneous vascular anomalies. Part I. Hamartomas, malformations, and dilation of preexisting vessels. J Am Acad Dermatol. 1997 Oct. 37(4):523-49; quiz 549-52. [Medline]. [Full Text]. Graham-Brown RA. Hepatobiliary System and the Skin. Irwin Freedberg AE, Klaus Wolff, K Frank Austen, Lowell Goldsmith, Stephen Katz, Thomas Fitzpatric. Fitzpatrick's Dermatology In General Medicine. Fifth. New York: McGraw-Hill; 1999. 1918. Henry F, Quatresooz P, Valverde-Lopez JC, Piérard GE. Blood vessel changes during pregnancy: a review. Am J Clin Dermatol. 2006. 7(1):65-9. [Medline]. [Full Text]. Detry O, De Roover A. Images in clinical medicine. Spider angiomas. N Engl J Med. 2009 Jan 15. 360(3):280. [Medline]. [Full Text]. Udell JA, Wang CS, Tinmouth J, et al. Does this patient with liver disease have cirrhosis?. JAMA. 2012 Feb. 307(8):832-42. [Medline]. [Full Text]. Niederau C, Lange S, Frühauf M, Thiel A. Cutaneous signs of liver disease: value for prognosis of severe fibrosis and cirrhosis. Liver Int. 2008 May. 28(5):659-66. [Medline]. [Full Text]. Hane H, Yokota K, Kono M, Muro Y, Akiyama M. Extraordinarily large, giant spider angioma in an alcoholic cirrhotic patient. Int J Dermatol. 2014 Feb. 53(2):e119-21. [Medline]. Yalcin K, Ekin N, Atay A. Unusual presentations of spider angiomas. Liver Int. 2013 Mar. 33(3):487. [Medline]. Salem A, Gamil H, Hamed M, Galal S. Nail changes in patients with liver disease. J Eur Acad Dermatol Venereol. 2010 Jun. 24(6):649-54. [Medline]. [Full Text]. Li CP, Lee FY, Hwang SJ, Chang FY, Lin HC, Lu RH, et al. Role of substance P in the pathogenesis of spider angiomas in patients with nonalcoholic liver cirrhosis. Am J Gastroenterol. 1999 Feb. 94(2):502-7. [Medline]. [Full Text]. Isner JM, Pieczek A, Schainfeld R, Blair R, Haley L, Asahara T, et al. Clinical evidence of angiogenesis after arterial gene transfer of phVEGF165 in patient with ischaemic limb. Lancet. 1996 Aug 10. 348(9024):370-4. [Medline]. [Full Text]. Li CP, Lee FY, Hwang SJ, Lu RH, Lee WP, Chao Y, et al. Spider angiomas in patients with liver cirrhosis: role of vascular endothelial growth factor and basic fibroblast growth factor. World J Gastroenterol. 2003 Dec. 9(12):2832-5. [Medline]. [Full Text]. Li CP, Lee FY, Hwang SJ, Chang FY, Lin HC, Lu RH, et al. Spider angiomas in patients with liver cirrhosis: role of alcoholism and impaired liver function. Scand J Gastroenterol. 1999 May. 34(5):520-3. [Medline]. [Full Text]. Iino S. [Differentiation alcoholic liver cirrhosis from viral liver cirrhosis]. Nippon Rinsho. 1994 Jan. 52(1):174-80. [Medline]. Sivarajan V, Al Aissami M, Maclaren W, Mackay IR. Recurrence of spider naevi following treatment with 585 nm pulsed dye laser. J Plast Reconstr Aesthet Surg. 2007. 60(6):668-71. [Medline]. [Full Text]. Becher GL, Cameron H, Moseley H. Treatment of superficial vascular lesions with the KTP 532-nm laser: experience with 647 patients. Lasers Med Sci. 2014 Jan. 29 (1):267-71. [Medline]. [Full Text]. Bjerring P, Christiansen K, Troilius A. Intense pulsed light source for treatment of facial telangiectasias. J Cosmet Laser Ther. 2001 Dec. 3(4):169-73. [Medline]. [Full Text]. Kono T, Sakurai H, Groff WF, Chan HH, Takeuchi M, Yamaki T, et al. Comparison study of a traditional pulsed dye laser versus a long-pulsed dye laser in the treatment of early childhood hemangiomas. Lasers Surg Med. 2006 Feb. 38(2):112-5. [Medline]. [Full Text]. Michel JL. Treatment of hemangiomas with 595 nm pulsed dye laser dermobeam. Eur J Dermatol. 2003 Mar-Apr. 13(2):136-41. [Medline]. Tan E, Vinciullo C. Pulsed dye laser treatment of spider telangiectasia. Australas J Dermatol. 1997 Feb. 38(1):22-5. [Medline]. [Full Text]. Tan OT, Gilchrest BA. Laser therapy for selected cutaneous vascular lesions in the pediatric population: a review. Pediatrics. 1988 Oct. 82(4):652-62. [Medline]. [Full Text]. Woo SH, Ahn HH, Kim SN, Kye YC. Treatment of vascular skin lesions with the variable-pulse 595 nm pulsed dye laser. Dermatol Surg. 2006 Jan. 32(1):41-8. [Medline]. [Full Text]. Collyer J, Boone SL, White LE, Rademaker A, West DP, Anderson K. Comparison of treatment of cherry angiomata with pulsed-dye laser, potassium titanyl phosphate laser, and electrodesiccation: a randomized controlled trial. Arch Dermatol. 2010 Jan. 146(1):33-7. [Medline]. [Full Text]. Large spider angioma on the left cheek of a child. The spider angioma has been compressed and is refilling rapidly from the central vessel. Multiple spider angiomas in a patient with cirrhosis. The authors and editors of Medscape Reference gratefully acknowledge the contributions of previous author, Mark Crowe, MD, to the development and writing of this article.